nikkistyle™: Sunkist Shades - HANDBAGS UNDER $100! 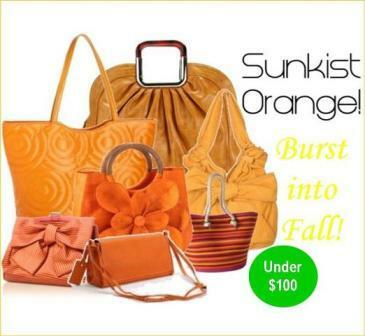 Sunkist Shades - HANDBAGS UNDER $100! Style Notes | Don't be afraid to amplify your look with a strong statement color, such as orange. This color screams personality! Too bold of a color to wear? No problem. Try something simple—like a glam handbag! Orange Is ... a must-have color this fall! So definitely incorporate a few citric-y Sunkist shades into your wardrobe this season! The tangy color has thee pop factor ... and will surely bring-to-life a simple neutral-colored outfit.